Pictorial Analysis of Mah. Temps for Jan-Apr on Stats Page and on Current Page World Averages of Major Cities of World and India from Rohit...great effort..
BB-1 Update ( Saturday12 noon IST)As on Saturday Morning (IST), NRL has announced the formation of a Low Level Circulation, an UAC and prelude to a Low at 3N and 84E. This is the initial formation stage of our BB-1, announced in vagaries yesterday (Friday). After reading and deciphering almost 8 International models, we see 3 different tracks shown by them as possible route of the system. 1. The system ,as a cyclone, hitting the TN coast, and tracking N/NW into the Interiors and finally dissipating over Vidharbh. 2. Some show the system heading straight North towards the Orissa coast, and striking there. 3. Some decipher the track as hitting the Southern India coast and re-emerging in the Arabian Sea, and moving up to 15N. All models have their justifications and methods of tracking, as computerized deciphering varies on the input and scenario possibilities as per the data feeding. Vagaries currently shows its track as the " red dotted Line " on the map below...and will try to track the path soon. We are still 10 days from actual striking of Land..but, as we get some definite and concrete indications, vagaries will put it up...as we would like it to be with minimum changes and variations. Another LLCC has formed at 4S and 80E. This is also mentioned below. What I would like to observe is the final outcome (the track that BB-1 and the Southern system take), when the actual "8" formation winds take shape...and of course the other parameters like LWD, jet streams and ridge line, SST and upper winds are being watched. Weather for the Weekend ( 4th,5th and 6th May) on the Sub-Continent:..Important: See Note on BB-1 Below.. The conditions on the weekend will be showing a slight shift of the Eastern trough towards W.Bengal. Hot, dry winds from the NW will heat up the Central Regions, and the Sindh region of Pakistan. Hence, precipitation wise, we will see thundershowers in Northern Kerala and adjoining Southern Karnataka. But, thundershowers shift into Bangladesh and W.Bengal on Sunday and Monday. Sunday, W.Bengal will get the scattered thundershowers. Thundershowers will also appear in adjoining Eastern Nepal and Kathmandu. On Monday,heavy squalls and Thundershowers are expected in the region of Kolkata and more in the Northern regions ( Districts North of Kolkata).Monday, W.Bengal, adjoining Eastern Bihar get thundershowers. Bangladesh gets heavy thundershowers on Sunday and particularly on Monday. Mumbai: Weekend will be warm and stuffy, with the temperature range between 33/34 - 25/26c at Scruz. Outer townships ( Thane, Panvel, Badlapur) will be hot at around 39c and will get stuffy at night. Kolkata: Around 37c, but thunder and rain possible on Sunday. Monday will be squally with stronger storm, possibly very heavy in some areas. 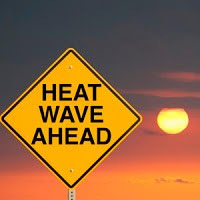 Surat: Warm, dry and sunny with days around 34/35c..
Nagpur: Extremely hot, very hot, with the possibility of the day temperature on Monday going to 45/46c, and Monday morning minimum at 30c ! A low pressure, BB-1, develops in the Southern Bay, SE off Sri Lanka around the 6th of May. Strengthened by various factors, the system will deepen into a depression by the 8th and a deep depression by the 9th/10th. Due to "high" resistance initially,BB-1 will not move beyond the 10N line till the 10th, and may just come upto East off Sri Lanka. Very soon, thereafter, indications are there of a rapid North wards movement due to favourable conditions, and possibly deepen more on its track. Vagaries will monitor the strength of BB-1, now a Deep Depression and its track, as it moves past Chennai after the 11th of May. Vagaries will announce if necessary the "Cyclone alert" once the strength and track of BB-1 is defined. At the same date, another strong system would have formed S/SW off BB-1, but below the Equator at 8S. Its going to complicate matters for the SWM...there will be hardly any clouding for the Andaman Seas..?? But our Andaman date could remain intact..?? very true rajesh sir , the depression which is likely to form below the equator is going to pull away the moisture from the Andaman sea. Are you sure the cyclone will not hit tamilnadu coast ? sam: With the system below the equator, the formation of the "8" winds, if they forem , will alter the scene. But, I think the dates could be maintained.. rkj...Replied in the post directly.. There was a small comment in kea biog . That is why i asked you. Small comment? We have already started tracking this system. Whether it comes to TN or heads up north, it will be closely monitored until landfall. Muhammad Irfan Bhundi: Weatherunderground forecasting maps and COLA agis had put up that track of forecast..
As I sit facing the Arabian Sea from my box seat in Kannur today morning, the south west looks dark and pregnant-checking SAT find a small band over the region, though bigger mass is way south of Minicoy !! Think the period is full of anticipation !! Rajesh sir forcast about bay low has taken shape. Bsngalore extrmely hot May - likely to touch 40s. No sign of rain. Only hope is current low if it hits TN temperatures and acute South Indian drought msy get relief. Yesterday visited breathtaking beatuy of Thane hills,leapords,Essel world - it is a nature paradise - mighty dense Borilvili national park forest seperating western Mumbai from Thane. Salsette islands-British most beautiful islands with dense forests. Godbunder road mangrove forests creek on one side and dense hills forests on other side!!! unpredictable weather nature. Recent may clones - Laila,Phet...Both Arabiab and Bay, east coast/west coast can host cyclones and landfalls any period of time with equal probability. Recent years have shown Arabian sea can host cyclones during Oct-dec with ease as bay and jan-mar bay can also host cyclones... whatever it is - it has to rain and give water to parched lands. Shankar - it just rained less than 10mm - which is nothing compared to huge water crisis BANG is facing-drought whole interior KAR. Remember BANG hardly receives any rain during entire june-sept - bulk of quantum should happen either by pre-monsoon or after SEPT (which last 2 years has failed). Probably bad news is some reports say low will move towards orissa - so TN/KAR will miss much required water. We will wait for RAJESH sir watch for next few days.